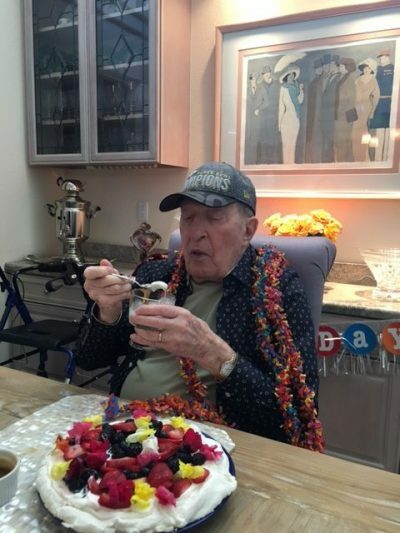 Bob Loup celebrating his birthday. The man of a thousand lives slipped into another realm early Thursday morning. Bob Loup, a long-time student of KE whose daily meditation practice was “D’layt Atar Panuey Menay” (There is no place empty of You) was my surrogate Dad and the surrogate Zayde (grandfather) to our young girls. There is a teaching in Kabbalah of the 36 hidden saints (Tzaddikim) who keep the world going. It would seem absurd to consider Bob a hidden anything—he was so much in the public eye through his many leadership roles and tireless fundraising. But what is seen and hidden is often not accessible to the public. To his dying day, Bob made calls on our behalf to reach our recent donor match goal ($36,000). Recognition was not what he sought. Purpose was always above self. He raised funds and souls. His hidden work now falls to another saint. Bob Loup’s funeral will be on Sunday, March 19th 12 pm at the Hebrew Educational Alliance. We will celebrate his life, mourn his departure and bring comfort to his wife, Robyn, and his entire family.